The Ole Miss Department of Art and Art History will host its first Art21 documentary screening at 5 p.m. on Tuesday night in 209 Bryant Hall in an effort to teach viewers about artists from the 21st century. Art21 is best known for producing “Art in the Twenty-First Century,” a PBS TV series that focuses on the technique and creativity behind contemporary art. Each episode depicts in-depth profiles and interviews with different contemporary artists. The purpose of the television series is to encourage exploration of new ideas in art. Kris Belden-Adams, an assistant professor of art history who specializes in the history of photography, organized the event. Helping her in this effort were her students, who have shared about the event on social media to reach the larger Oxford community and promoted the event at the UM Museum. The art department reserved a room that holds a hundred people for the screening. Belden-Adams said the department expects a lot of art students to attend but that the faculty hopes students from various majors take interest. 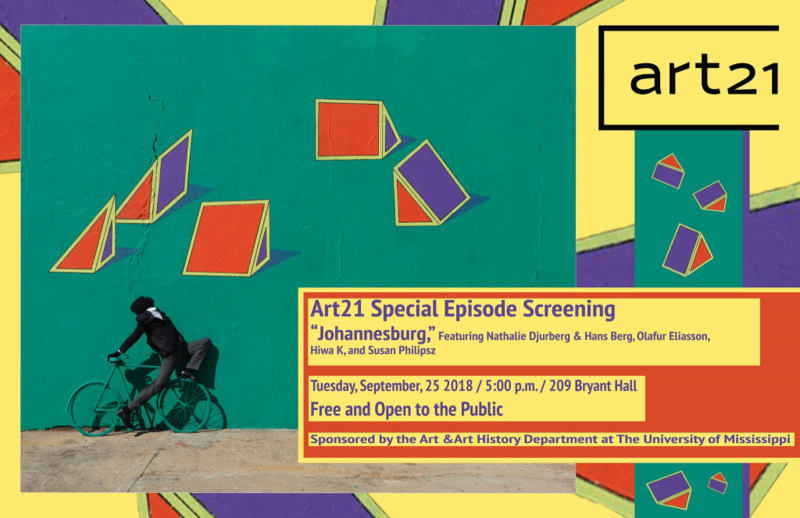 The hour-long episode that the department is screening is “Johannesburg,” the first episode of the ninth and latest season of “Art in the Twenty-First Century.” This episode explores the work of four South African artists from different backgrounds and generations, who use their art to examine the history and future of South Africa. The four artists featured are David Goldblatt, from Randfontein; Nicholas Hlobo, from Transkei; Robin Rhode, from Cape Town; and Zanele Muholi, from Umlazi. Rhode, known for creating outdoor murals that become backdrops for his photography, leads a team of local young men that help him create the murals in the documentary. A creator of handcrafts, paintings and sculptures, Hlobo uses his art to bring light to the challenges of his country’s young democracy. Muholi and Goldblatt are both photographers. Muholi photographs the South African LGBTQ community, which motivates him to help get rid of the stigma and violence towards it. Goldblatt, who has been a photographer for nearly 60 years, examines the country’s changing politics through his photographs of architectural structures.